Glass fire pits have been a popular feature in outdoor patios in restaurants and homes, but more and more homes are incorporating them into their designs, in large part due to their versatility. Fire glass, made of tempered glass, leaves no trace of ash, soot or noticeable odor, and does not produce smoke, unlike wood-burning fire features. Fire glass is broken tempered glass which functions as a medium to retain and direct heat in fireplaces. The glass obscures the burners and pipes, making them popular decorative elements indoors and outdoors. Fire glass is available in a wide variety of colors, shapes and sizes, and is typically made from recycled glass. The glass retains its color over time and does not emit any carbon toxins, making it an eco-friendly burning solution. During the manufacturing process for fire glass, sheets of glass are tempered, then shattered and tumbled to eliminate sharp edges, reducing the risk of injury. The tempering process not only allows the glass to be shattered into small pieces, it also prevents the glass from “popping” due to the ability to withstand heat. Quality Glass and Mirror is excited to announce that we will soon be offering fire glass! Distributors are encouraged to contact us at info@qualglass.com for details. 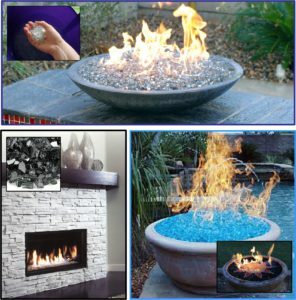 Check back for more details and start planning your fire glass features now!